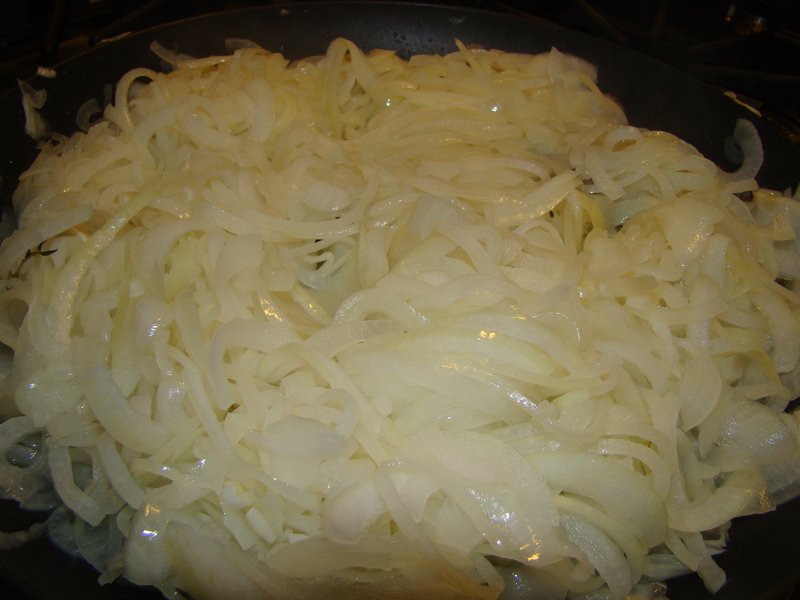 Posted on 21 October 2011, in French Fridays with Dorie and tagged French Fridays with Dorie, onions, tart. Bookmark the permalink. 25 Comments. Glad you gave those slow onions a chance! Your pissaladiere looks great! Two hours is a long long time if you’re waiting. Luckily you had enough time to prepare them. They look great after two hours though. I think your tart looks good, and that the early addition of the anchovies and olives was not a problem. 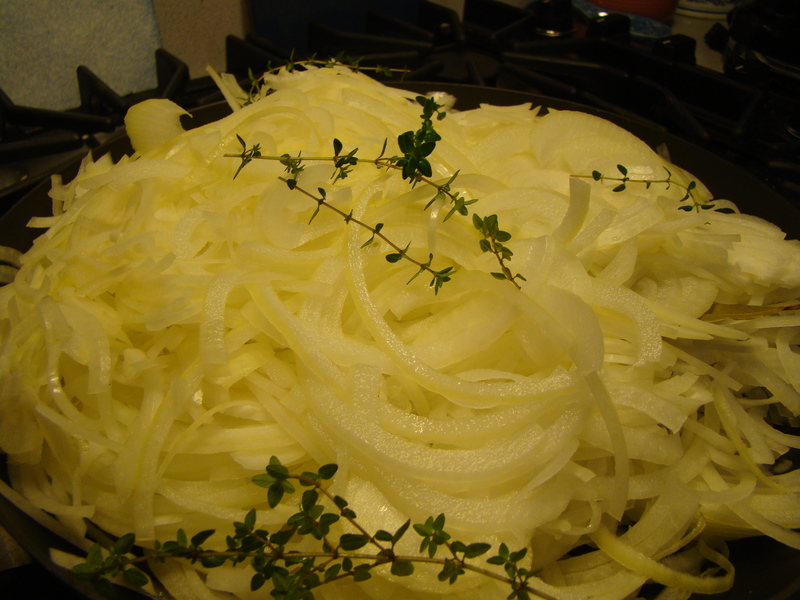 Two hours to get golden onions – now that’s devotion! I would have given up way before then. Mine took almost 2 hours too, although I also prefer the taste of onions a step just beyond caramelized which might be called carbonized or maybe exterminated. Your final dish looks delicious, even if you did alter the directions a bit! My onions took about 2 hours as well. Luckily I started early! Your tart looks delicious even if you weren’t happy with the crust. Now you have an excuse to make this again! Betsy. My onions took about an hour. 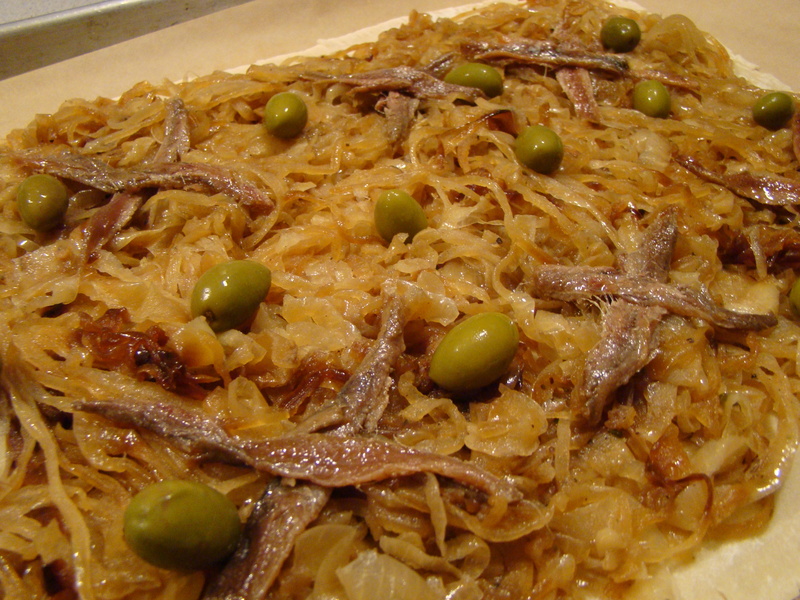 They came out so wonderful and I really enjoyed them…not so for the anchovies! I just couldn’t do them. Your Pissaladiere looks delicious! Have a nice weekend! Thank Goodness I’m not the only one who had onions that took more than 45 minutes! I think mine were a good two hours. My house still smells like onions three days later, even with airing it out! Your Pissaladiere looks pretty fantastic! I used puff pastry, too, and mine worked out great. The pastry was homemade, using Nick Malgieri’s recipe. I would make it that way again anytime. Yours looks great! 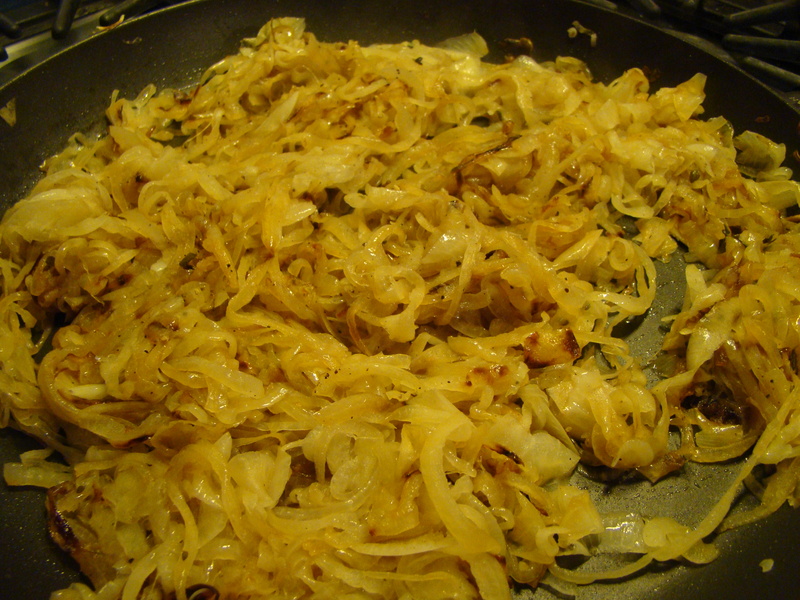 I cooked the onions for about an hour and a half… I didn’t think they would take that long to caramelize! Glad to see I wasn’t the only one who added all the ingredients to the pissaladiere from the start. I think you’ll really like it with the yeast dough, Betsy. My onions took about an hour, but I have to confess with playing with the heat because I was getting a little impatient. ;) I felt the same way about the smell, but with the anchovies. I kept smelling them even the next day! I love the ‘x’ and ‘o’ pattern you made. Did Howard notice? My onions took quite a while, too. I was having a Dorie marathon that day, so I used the time on other recipes. The yeasted crust is great – you’ll definitely have to try it. I’m going to add some herbs to mine next time, though. It may not be traditional, but I think it will be good. Whew – I am glad it wasn’t just me. I had the flame on fairly low so I wouldn’t burn them – and then I had shut them off for a while (in which time, I couldn’t restart because there was no electric supply for the electric start on the burner). That being said – I think my actualy cooking time had to be at least an hour and a half. Well – it looks good. I prefer green olives on anything, and think I would go with that next time as well. 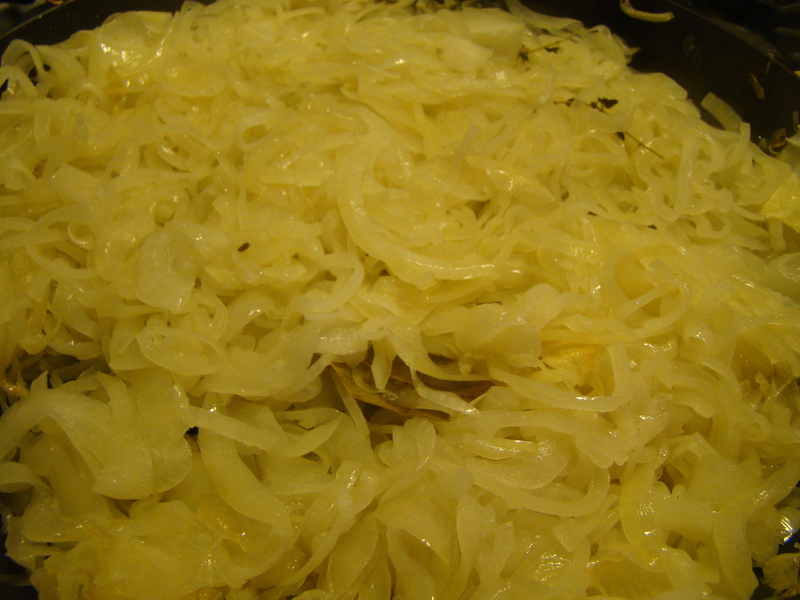 My onions really took more than an hour, I stopped looking at the clock, but it was less than 1.5. I wasn’t that patient with my onions, well done… 2 hours! Time paid off because they look great. I used puff pastry too, it puffed but was soft in the middle. I will have to try the dough recipe. It’s amazing what patience will do! your onions are beautiful; I forced my onions out of the pan at an hour. Definitely need to add more time next time. I went the long route, and wish I’d used puff pastry. ha! This looks great. Your onions look like they were worth the wait. 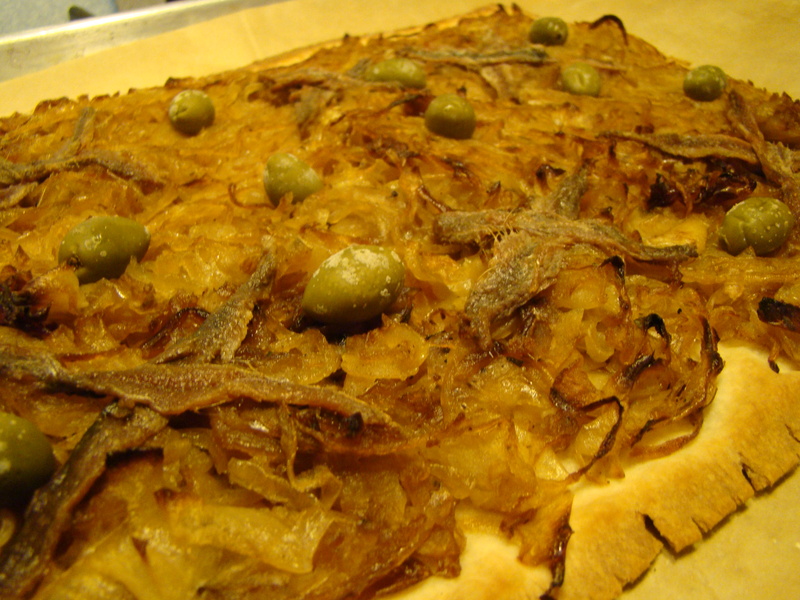 I used the puff pastry, but I baked it first and then added the onions and anchovies for the last ten minutes. It puffed just fine, but I wasn’t the biggest fan on the anchovies! Interesting to see the puff pastry. Your onions look great even if they left an interesting smell behind. I think you should try the dough; I’m sure you’d like it. Maybe when you get some time…and that is a hard thing to find. I think making everything in the surrounding area smell like onions is a net positive, not a negative! I think cooking the sardines might be kinda nice as long as they don’t smell up too much. I used the puff pastry on mine as it was a time issue. I will definitely make this one again. the green olives are making my mouth water … yum!